Sounds are part of our daily life and it only seems natural, at least while standing next to your computer, to be surrounded by likable sounds. The sound scheme that comes with Windows Vista is pretty good but it can become boring after a while. Considering that each person has its own personality and preferences, it is easy to understand why somebody would want to change their sound scheme to something more personal. 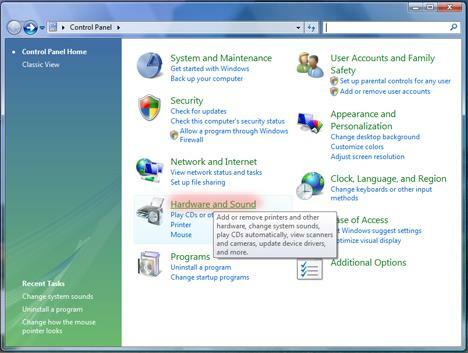 In this article I will show you how to change your sound scheme in Windows Vista and how to customize the system sounds. Before following the procedure below, you might want to know what a sound scheme is. 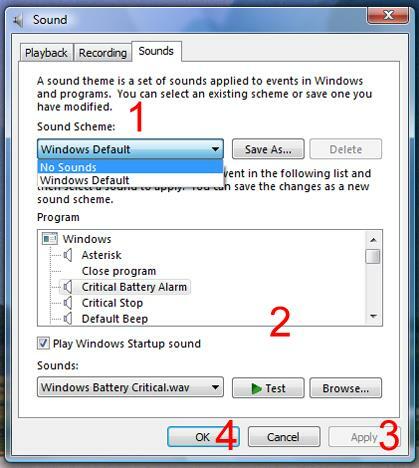 Basically, a sound scheme represents all the sounds that Windows Vista plays when you make different actions such as emptying the recycle bin, deleting a file, clicking on a button, or when different events take place like: encountering an error, finishing the burning process of a DVD, etc. Sound schemes can be found on the Internet on several websites. After doing a search for vista sound scheme I ended up finding a lot. Some may have their own installers, meaning that you will have to download a setup.exe file and run it to have the sound scheme up and ready, while others need some tweaking to make them work. Since installing sound schemes that have their own installers is obvious and simple, I will only show you how to install a sound scheme that doesn't come with an installer, just because I know it involves a bit more attention. Since installing a new Windows Vista scheme requires you to overwrite the default sound files, you should backup your original sound scheme before installing a new one. 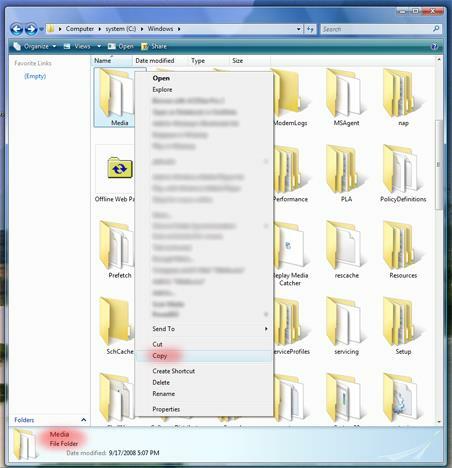 To do this, go to 'C:\Windows\', find the Media folder, right click on it and select Copy. Once you have done this, Paste the content to a place where it's easy for you to remember. If you decide later that you want the default sound scheme back, you just need to copy this folder back to its initial location. To describe the procedure, I will use as an example the Glass and Pearl Sound Schemes. The procedure should be similar for other sound schemes found on the Internet. First, download the archive containing the two sound schemes and unpack its content. When the folders from the archive have been unpacked, go to one of its two folders and there you will see some sound files with the extension '.wav'. Select all the sound files by pressing Ctrl+A. 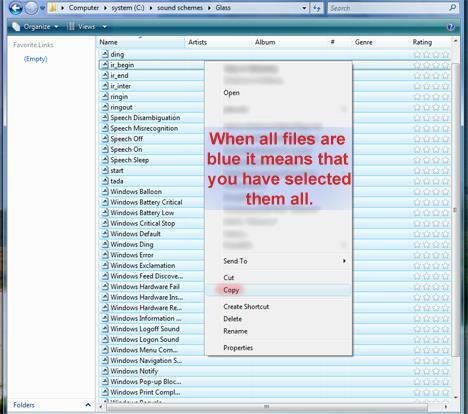 When all files are selected, right click and in the contextual menu click Copy. Now, browse to 'C:\Windows\Media'. Once you are there, take the cursor to a white space, right click and, in the contextual menu, click on Paste. Windows Vista will ask if you want to overwrite. 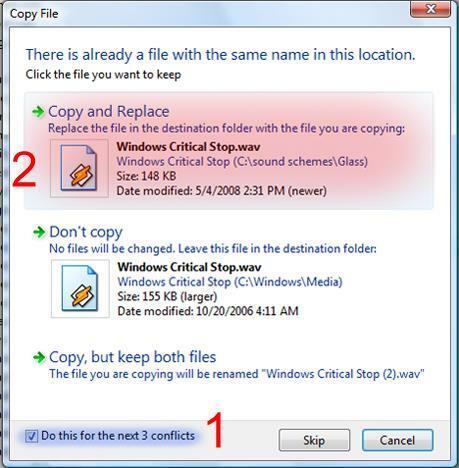 Check the 'Do this for the next ... conflicts' like in the image below and then click 'Copy and Replace'. 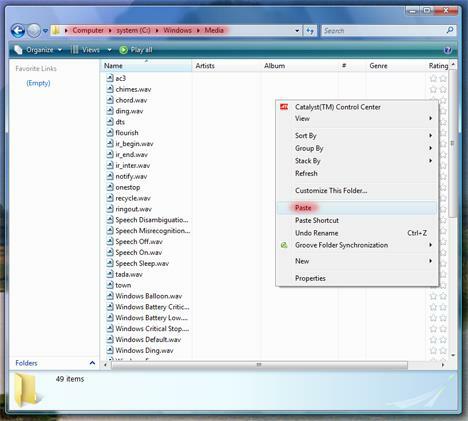 Now the Windows Vista default sounds are changed with the new ones which you just copied. To further suit your needs, you can customize all the sound schemes installed on your computer. For example, you can change one or more sounds from any scheme, you can switch between schemes or you can delete any of the installed sounds schemes. 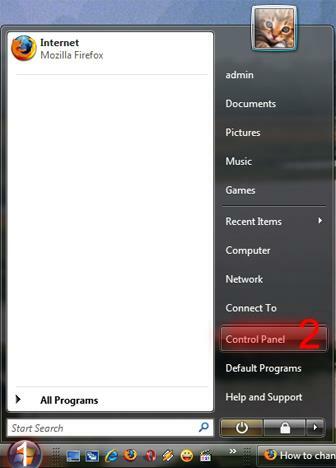 All these activities are done in the Control Panel. Once you are in the Control Panel, click on Hardware and Sound. When the Hardware and Sound page appears, click on Change system sounds. A new window called Sound will appear. To change the current sound scheme, click on the drop-down list, select the scheme you prefer and then click OK. If you want to change a specific sound from the selected sound scheme, click on the event or program which 'generates' that sound, then click on Browse and select the new sound file that will be played from now on. The sound file should have the extension '.wav' and should not last longer than a few seconds. If you want to delete a sound scheme, first select it from the drop-down list with sound schemes and then click Delete. 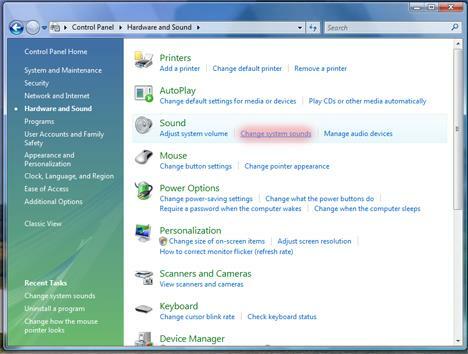 When you have finished making all the changes, click Apply to save your settings and then OK to close the Sound window. NOTE: Some may consider using favorite movie quotes when the computer starts or stops or when other events take place. There is nothing compared to Neo, Jack Sparrow or Darth Vader giving one of their most inspiring lines to start your day. The Internet is full of sites like MovieWavs filled with thousands of movie quotes. I stubled on this page while looking for a more asthetically pleasing sound mixer. Something that looks sleep if left open. (I use my laptop as my game/media/main pc). So I can have up to 4 or 5 sounds going at any one time. My amp allows me to seperate each channel to any of 7 towers, and the sub. But honestly, for all the work Microsoft has done to make their OS look better. They havnt touched certain menues and apps since I think never! any ideas?